Charles Kim. 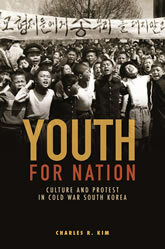 Youth for Nation: Culture and Protest in Cold War South Korea. 2017. This in-depth exploration of culture, media, and protest follows South Korea’s transition from the Korean War to the political struggles and socioeconomic transformations of the Park Chung Hee era. Although the post–Korean War years are commonly remembered as a time of crisis and disarray, Charles Kim contends that they also created a formative and productive juncture in which South Koreans reworked pre-1945 constructions of national identity to meet the political and cultural needs of postcolonial nation-building. He explores how state ideologues and mainstream intellectuals expanded their efforts by elevating the nation’s youth as the core protagonist of a newly independent Korea. By designating students and young men and women as the hope and exemplars of the new nation-state, the discursive stage was set for the remarkable outburst of the April Revolution in 1960.Kim’s interpretation of this seminal event underscores student participants’ recasting of anticolonial resistance memories into South Korea’s postcolonial politics. This pivotal innovation enabled protestors to circumvent the state’s official anticommunism and, in doing so, brought about the formation of a culture of protest that lay at the heart of the country’s democracy movement from the 1960s to the 1980s. The positioning of women as subordinates in the nation-building enterprise is also shown to be a direct translation of postwar and Cold War exigencies into the sphere of culture; this cultural conservatism went on to shape the terrain of gender relations in subsequent decades.